Product prices and availability are accurate as of 2019-04-17 11:18:06 BST and are subject to change. Any price and availability information displayed on http://www.amazon.co.uk/ at the time of purchase will apply to the purchase of this product. The 1997 vintage of Lagavulin's Distillers Edition bottled in 2013. 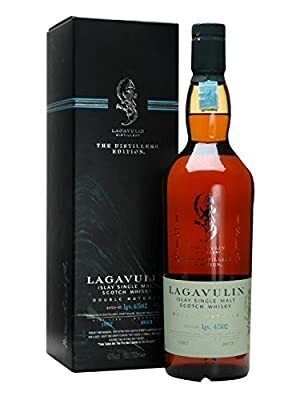 By far the most popular of the Distiller's Edition series, this double-matured Lagavulin has had a finishing period in sweet, sticky Pedro Ximénez sherry casks. A whisky that never disappoints. 70cl Glass Bottle ABV: 43% Scotch Malt Whisky from the Islay Region of Scotland Savour it neat, on ice, with a mixer or in a cocktail. It is an offence for any person under 18 years to buy or attempt to buy alcohol. Please drink responsibly.